The Department of Foreign Affairs sets a global stage for Ang Misyon’s Orchestra of the Filipino Youth – Ang Misyon, Inc.
Ang Misyon’s Orchestra of The Filipino Youth joined by (L-R) Mr. Jovianney Emmanuel Cruz- co founder of Ang Misyon, DFA Assistant Secretary Leo Herrera-Lim, Mr. Federico Lopez – co founder and President of Ang Misyon, DFA’s Ms. Maria Theresa Dizon De Vega, DFA Undersecretary Ambassador Manuel A.J. Teehankee, Mr. Joshua Dos Santos- conductor of the OFY, Venezuelan Ambassador Capaya Rodriguez Gonzales, DFA’s Ms. Maria Louella Duarte, members of the OFY, and Ms. Marianne Quebral- Ang Misyon’s Director for Marketing & Partnerships. As a part of the Department of Foreign Affairs program on cultural diplomacy, the Office of International Economic Relations (OUIER) presented a concert featuring Ang Misyon’s Orchestra of the Filipino Youth (OFY) last May 10, 2018 at the DFA Auditorium in Manila. The OFY performed a full orchestra concert to diplomats from all over the world, with ambassadors from more than 10 different countries in attendance. Their repertoire spanned classics, from the compositions of Peter Tchaikovsky to the old Filipino favorite, Maalala Mo Kaya. A notable guest at the event was Her Excellency Ambassador Capaya Rodriguez Gonzales, envoy of Venezuela to the Philippines. Ang Misyon finds its roots in the Venezuelan based El Sistema, an internationally renowned music program that works towards creating opportunities for children from underprivileged communities. In its six years of operations in the Philippines, Ang Misyon’s Sistema for the Filipino Youth Program has taught music and made a difference in the lives of more than 500 children from communities all over the country. The OFY includes scholars as young as 10 years old with children coming from as far as Bulacan, Cardona, and even Talim Island- a lake island in Laguna de Bay. Since starting the program with Ang Misyon three and a half years ago JM, an 18-year-old violin player from Taguig has progressed from level 1 to becoming the concert maestro of the OFY. After several years of classical music training he now aspires to find work as an orchestra or chamber musician. Similarly, Monic, a viola player who has been with OFY since its inception in 2012 has gone on to mentor the younger members of the orchestra. Now 23 years old she works in the food services industry during the weekdays as an assistant chef. She claims that her weekends are for music as she spends them with the OFY. Monic credits Ang Misyon for teaching her the value of discipline and commitment in everything she does. According to her, playing for the OFY means more than just music. With the many achievements of Ang Misyon in less than a decade of work, the DFA saw a fit opportunity to support a musical group unique to the Philippines. In his opening remarks during the May 10 concert Under Secretary for International Economic Relations Manuel Antonio Teehankee spoke about the humble backgrounds of members of the OFY and how this provides relevant insight into the socio-economic context of the country. “The musical talents and abilities of the OFY dispel the mistaken perception that classical music is unreachable and exclusive only to the upper classes of society,” Usec. Teehankee said. It is his belief that a project like Ang Misyon will resonate not only with the many Filipinos working and living abroad but with the whole world. Through a partnership with Ang Misyon, the DFA’s Cultural Diplomacy Unit also hopes to be able to showcase internationally the musicality and talents of Filipinos. In many ways the May 10 concert set the stage for the Orchestra of the Filipino Youth to perform for a global audience. 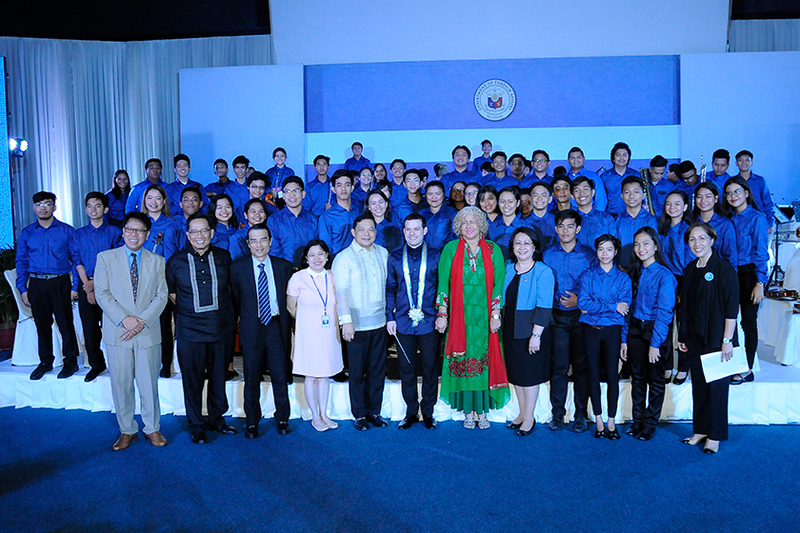 The Cultural Diplomacy Unit sponsored the performance primarily to invite the diplomatic corps present in the Philippines. The concert ended with an overwhelmingly positive response from the international audience. Having supported world tours of renowned Filipino performance groups such as the Bayanihan Dance Company and the UP Madrigal Singers in the past, the DFA looks forward to helping Ang Misyon share their music with the rest of the world.